As of July 31, 2016, the Armenian Youth Federation’s ‘With Our Soldiers’ campaign has reached 82 families and distributed a total of $96,750 to families of fallen soldiers of Artsakh. Volunteer Gagik Parsadanyan, and servicemen Armen Gasparyan, Norayr Gasparyan, and Narek Mkrtchyan are four out of thirteen soldiers whose families were given financial relief through the Armenian Youth Federation’s ‘With Our Soldiers’ campaign. 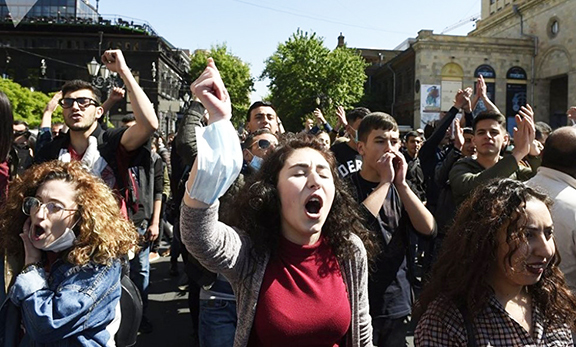 The Armenian Youth Federation’s “With Our Soldiers” campaign distributed $7,250 to the families of six servicemen from Armenia’s the Lori and Tavush provinces who were killed in April. The Armenian Youth Federation’s “With Our Soldiers” campaign distributed $8,750 to the families of six servicemen from Stepanakert who were killed in April. The Armenian Youth Federation’s ‘With Our Soldiers’ campaign has released information on the visits to the families of five fallen servicemen in the city of Shushi and the Martuni regions of Artsakh. Representatives of AYF’s ‘With Our Soldiers’ campaign visited the regions of Askeran, Kashatagh, and Martakert, distributing $6,000 to the families of 4 servicemen who were killed in early April. The Armenian Youth Federation’s ‘With Our Soldiers’ campaign has published a report on its progress during the past two months of fundraising efforts and the work done on the ground in Armenia. The representatives of AYF’s “With Our Soldiers” campaign and the Armenian Relief Society of Artsakh met the families of the 9 servicemen from Hadrut, who were killed in early April, at the ARS office in Stepanakert, delivering $13,750 in assistance. In light of the recent activities taking place in Artsakh, the AYF Camp Management Board and Committee have decided to dedicate the Summer 2016 session to Artsakh.